Growing up in St. Louis, Mo., and Stamps, Ark., she was Marguerite Johnson. It was her brother who first called her Maya, and the name stuck. Later she added the Angelou, a version of her first husband's name. Angelou left a troubled childhood and the segregated world of Arkansas behind and began a career as a dancer and singer. She toured Europe in the1950s with a production of Porgy and Bess, studied dance with Martha Graham and performed with Alvin Ailey on television. In 1957 she recorded an album called "Calypso Lady." "I was known as Miss Calypso, and when I'd forget the lyric, I would tell the audience, 'I seem to have forgotten the lyric. Now I will dance.' And I would move around a bit," she recalled with a laugh during a 2008 interview with NPR. "She really believed that life was a banquet," says Patrik Henry Bass, an editor at Essence Magazine. When he read Angelou's memoir I Know Why the Caged Bird Sings, he saw parallels in his own life in a small town in North Carolina. He says everyone in the African-American community looked up to her; she was a celebrity but she was one of them. He remembers seeing her on television and hearing her speak. "When we think of her, we often think about her books, of course, and her poems," he says. 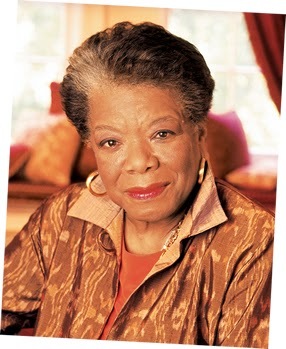 "But in the African-American community, certainly, we heard so much of her work recited, so I think about her voice. You would hear that voice, and that voice would capture a humanity, and that voice would calm you in so many ways through some of the most significant challenges."